At Primo Smash Repairs, we believe that if you want the best, you should use the best. This is why we use Standox paint technology when carrying out car spray painting and car paint repairs in Perth. 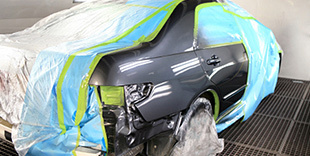 All car painting work done by the skilled painters at our workshop is guaranteed for life. What does professional Car spray painting include? Colour Matching– We can match any colour of car with our extensive range of paints. Car paint repairs– Primo Smash Repairs can neatly touch up a spot on your vehicle that has been knocked or dented. Full re-sprays– If you would like to change the colour of your vehicle, we can provide a full re-spray of the surface area. Why choose professional spray painters? Your vehicle is a major investment and deserves both time and attention, in order to keep it looking fresh, refined and well looked after. To extend the life of your car’s paintwork, it’s important to ensure any need for car spray painting is taken care of by a professional team. Our Perth painters are leaders in the industry, offering their qualifications and skills to ensure your car painting job is done to the absolute highest possible standard. We use only the most highly trained and experienced car spray painting team, so you can be sure to get the best result, the first time, every time. Get in touch with the team at Primo Smash Repairs on 08 9444 9199 if you’re interested in receiving a quality service, getting an entirely new look for your car – or just having a spot or two retouched. Our car painting services range from simple car paint repairs to full re-sprays. You’re sure to get the quickest and most efficient service possible from our team, and when we say the job’s done, you can rest assured that it’s been done to perfection. As a result, you’ll leave us proud to have you as another satisfied customer.